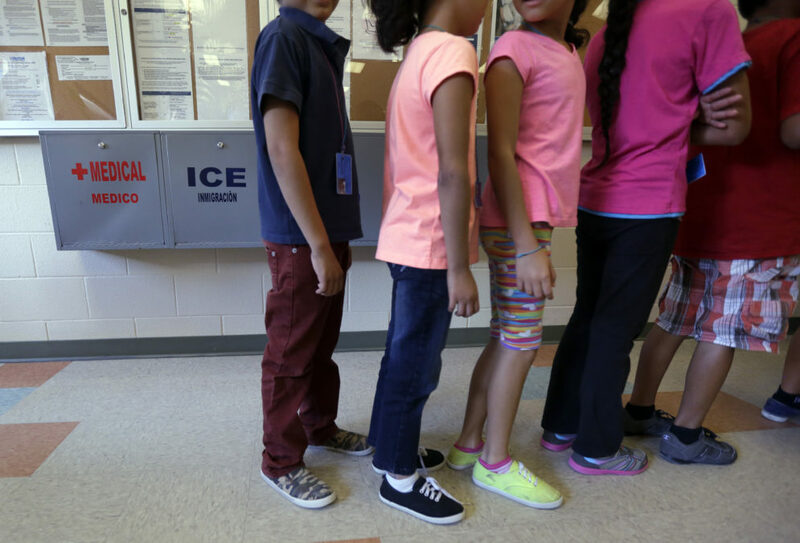 Detained immigrant children line up in the cafeteria at the Karnes County Residential Center in 2014. The temporary home in Texas houses immigrant women and children detained at the border. Migrant families could be held indefinitely in unlicensed detention centers under a new federal plan that also would end critical court protections for immigrant children, according to new court records. Under the so-called Flores agreement, created in 1997, the U.S. Office of Refugee Resettlement “shall release a minor from its custody without unnecessary delay” to a parent, relative, legal guardian or adult designated by a parent. But new Trump administration regulations would dismantle the landmark Flores agreement and allow authorities to release children only to a parent or legal guardian – even if those adult guardians are detained. The new restrictions would maintain “family unity,” according to the government. But immigration lawyers argue that some children could be held in detention with their parents indefinitely while their immigration case is pending. Lawyers also raise concerns about licensing requirements. Under Flores, children must be placed in state-licensed shelters that require certain standards such as specific staff-to-child ratios and reporting suspected child abuse. In another significant change, the new Trump regulations would allow children who arrived with parents to be detained in unlicensed family detention centers. The Department of Homeland Security would hire an auditor to “ensure compliance with the family residential standards established by ICE (U.S. Immigration and Customs Enforcement),” the rules read. Put another way, the government would be licensing itself. “It’s absurd,” said Neha Desai, immigration director for the National Center for Youth Law and one of the lawyers in the Flores case. “If these regulations were to go into effect in this country, it would be a dramatic step backward in providing the most fundamental of rights and protections for some of the most vulnerable children in this country,” Desai said. The new regulations would affect the nearly 13,000 children currently in the care of the Office of Refugee Resettlement, which operates more than 100 shelters in 17 states. “What they’re trying to do with the rules is expand their power to detain families and children for longer in worse conditions,” said Ai-jen Poo, one of the leaders of the Families Belong Together coalition. The Flores agreement forced the government to comply with a set of national standards on the detention, care and release of immigrant children. The settlement was a result of a class-action lawsuit filed in 1985 by immigrant advocacy groups over the treatment of unaccompanied minors. In September, the Departments of Homeland Security and Health and Human Services moved to replace the agreement with the new regulations. Lawyers representing the children filed an injunction Nov. 2, arguing that the new rules violate the terms of the Flores agreement. The Department of Health and Human Services declined to comment because the case is pending. In a response filed last week, government lawyers argue that the injunction is “premature” because the regulations aren’t finalized. Officials still have to review more than 95,000 comments submitted by the public since the rules were posted in the Federal Register on Sept. 7. The new rules also would strip children of the right to see an immigration judge if they’re considered a flight risk or a danger to themselves or others. Instead, a minor could request a hearing before an official from the Department of Health and Human Services, “hardly a neutral and detached decisionmaker,” lawyers say in court filings. That arrangement may mean more children end up in psychiatric facilities or jails such as the Yolo County Juvenile Detention Facility in California, where minors have reported being pepper-sprayed by guards. Leah Chavla, policy adviser at the Women’s Refugee Commission, said the proposed regulations are concerning because the government has violated the Flores agreement before. Over the summer, for instance, Shiloh Treatment Center near Houston came under scrutiny for injecting immigrant children in its care with powerful psychiatric drugs without proper consent. A federal judge ordered the government in July to stop the practice, though attorneys allege it’s still continuing. A hearing on the regulations is scheduled for Nov. 30 in front of U.S. District Judge Dolly Gee in the Central District of California. This story was edited by Robert Salladay and copy edited by Nikki Frick.